I haven't played that much Beta last week. There are two reasons for that. The first is protection. Protection against playing burnout. As mentioned before, I did level to 100, and after that did a lot of artifact-quests for other specs. I even re-did the Moonkin-Artifact quest, and it seems to be fixed now. But I just didn't want o put that much time in the so-called End-Game. I just don't have the time for that. The other reason is alt-raids. Innovation was on a little break, and some alt-raids where scheduled. Both my Hunter Forak, and my Paladin Timicin used that. And it is fun to make a character really raid-ready. The break stops this week, but thursday will probably stay an alt-day. In the coming weeks, people will be able to bring new characters to the raid to test out, if their intention is to raid with that character in Legion. And the pre-patch is coming soon I guess...which makes me not happy. As mentioned before, balance without the Moon-spell is not fun. Beta-testing, wait..a Postbox in the Druid Class Hall??? Now I am lucky, during the pre-patch, I am not abe to play that much. A Wedding, a guild-meet, and general vacation... 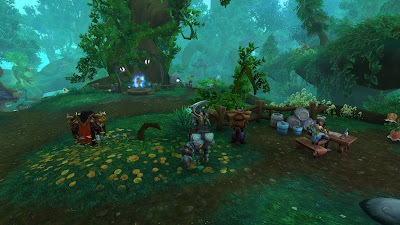 I am lucky to not play Moonkin... that just sounds strange. Luckily, the moment I got the Artifact everything will be ok... can we just take a moment to look at the date. Legion will be released August 30th, which is the most idiotic date to release a game for me. I work in Education, this is the beginning of a new School Year, I don't have time for that... and it is also not a good idea for all the students to play at that time... you don't need to many distractions at the start of a new schoolyear. Cyous is a player who is very clear on things that happens to Balance Druids. He is active on both the official forum, as on fan-forums like MMO-Champion. As far as I know, he knows his stuff, and he keeps his cool..until the post I linked... if this keeps up.. maybe Balance is not that good an idea for Legion.